Today I'm sharing some of my favorite photos that I have taken. Keep in mind that I do not own a fancy, real camera. Most of these were taken with a point and shoot camera, my iPhone, or (in two cases) my Mom's fancy, real camera. I'm not a professional, but I love capturing moments and different scenes. Please be nice and don't steal any photos on this page or elsewhere on this site. All photos are mine unless otherwise noted. 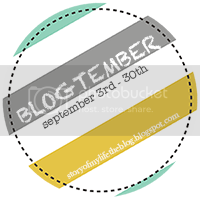 Linking up with Jenni today for Blogtember!